I was reading in the NY Times of a poor woman who all but succumbed to scurvy. Some maladies are so pleasant to prevent. 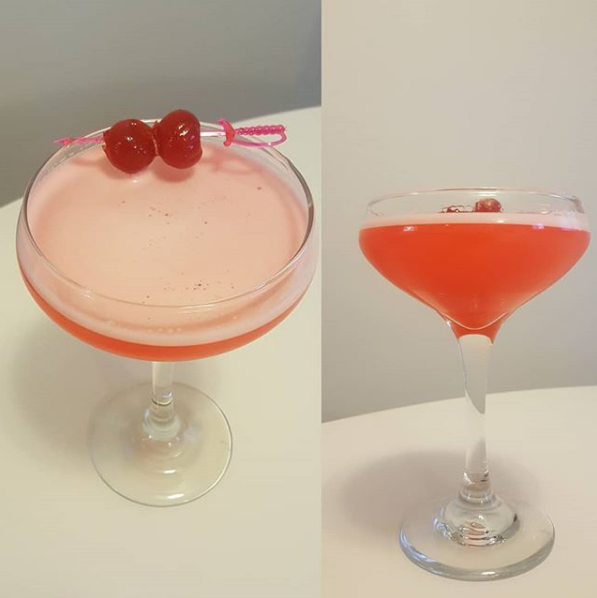 I made a new drink for my sister "The Pink Lady"
I read in the URL that you thought the drink was too sweet, did you leave lemon juice out of the drink or was it just accidentally omitted from the ingredients list on the page? The recipe I had didn't call for any lemon juice. (It was from "My Bar" cocktail app). Yeah, it looks like recipes are all over the place for that drink, but with 3/4 oz of grenadine, you'd want the same amount of lemon juice to balance that out. You also might find half an ounce or less of grenadine would be better too. Did a take of my favorite cocktail - with my current favorite sipping rum. Going for sweet peanut-butter candy flavors. I've just made this, it was nice, predictably quite manhattan-ish but I liked the sweet notes. I might try it again with my peanut infused bourbon in place of the rye. Report back if you do! 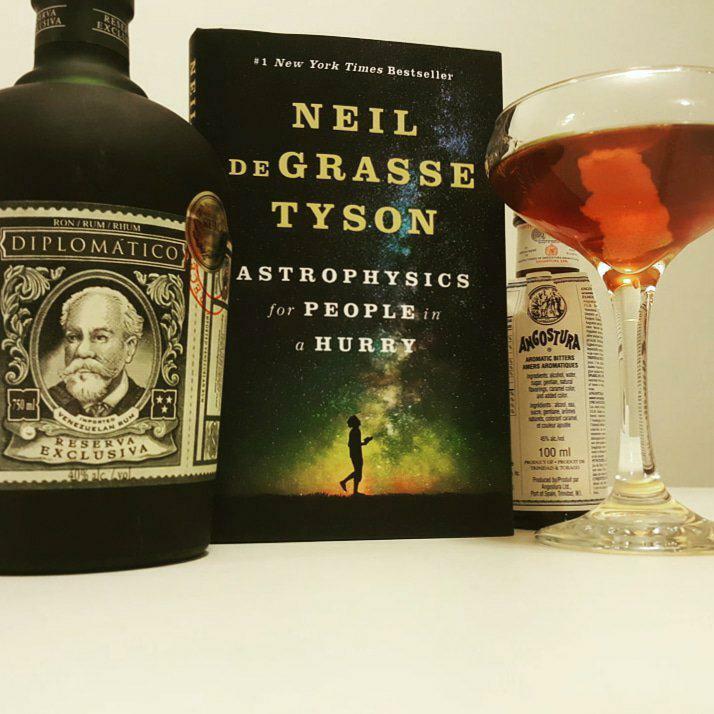 I wonder if the spiciness of the rye (and bitters) are the only thing keeping it from being cloying. But I think the peanut infusion could work really well. Now you've got me thinking (not always the easiest thing to do ...). I tried Craig's original a few nghts ago when it appeared on Kindred. An American colleague years ago gave me some Reece's peanut butter thingies to try; I can't say that experience changed my life, but I enjoyed the drink without any particular taste flashbacks. However, I have some date-infused rye about me (soak dried dates in cheapish rye for about a week - 20 dates to a 750ml bottle is about right) which makes a superior Brooklyn. 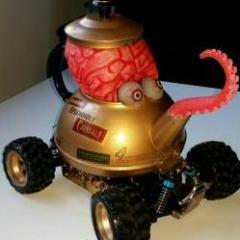 I think it could be worth a try in this one. Right; that's tonight's drink sorted. Thanks, gentlemen. One hour later: Ooooh, that's nice. If you're already struggling with sweetness you won't find the use of date-infused rye* an improvement, but I like it a lot in this. 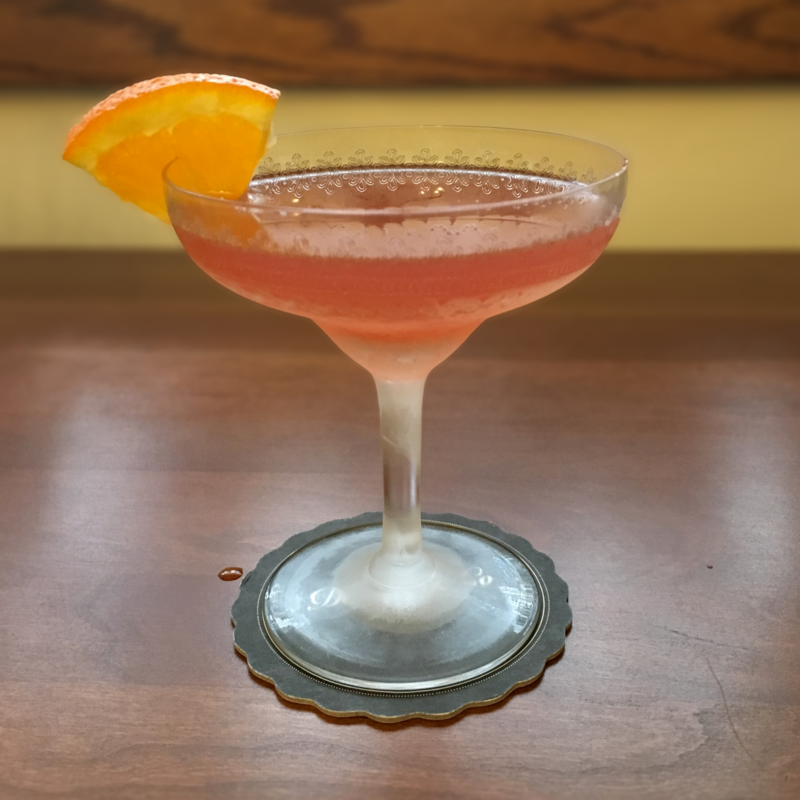 I know that real cocktail people don't get their recipes from restaurant cookbooks but as an occasional cocktail drinker, I sometimes do. 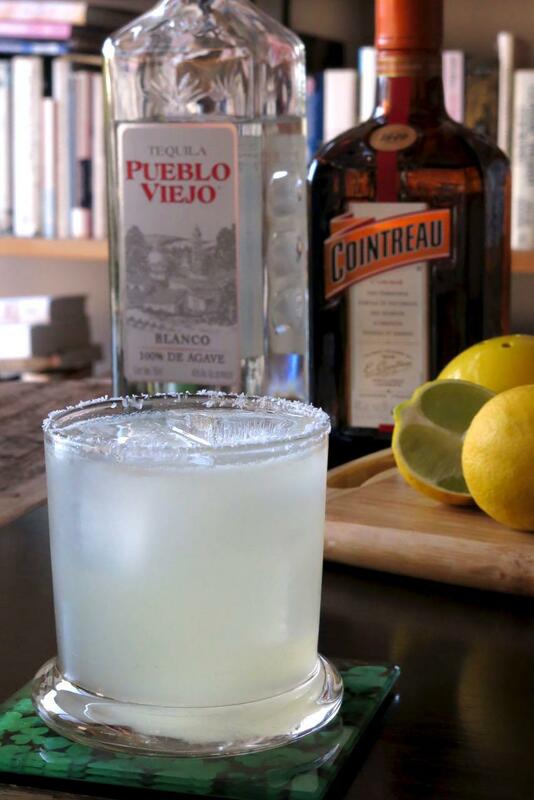 Here are the cocktails I've recently tried from Gonzalo Guzmán's Nopalito cookbook. Nopalito's El Diablo recipe uses less cassis than other versions I've seen and it's more refreshing to my taste. 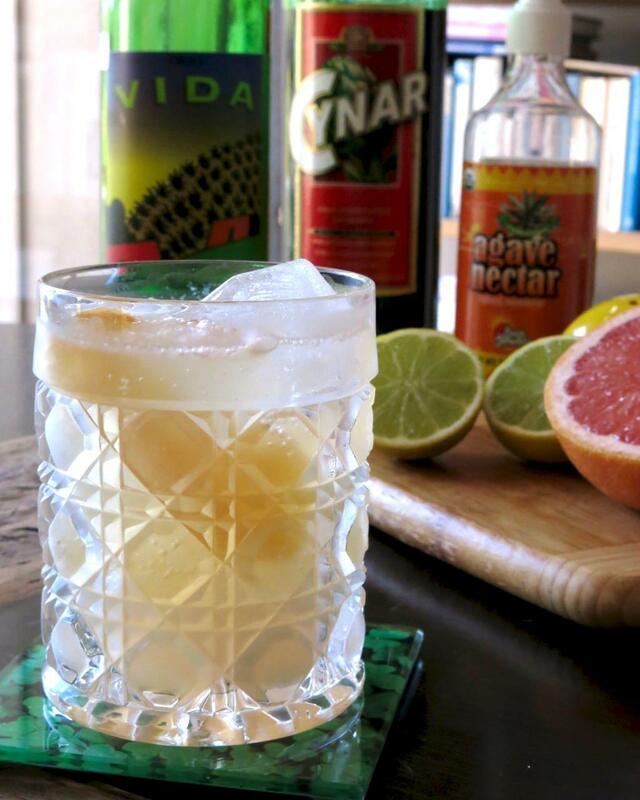 Mezcal Paloma - the Nopalito version swaps in mezcal for the usual tequila and uses fresh juices and a dash of Cynar. 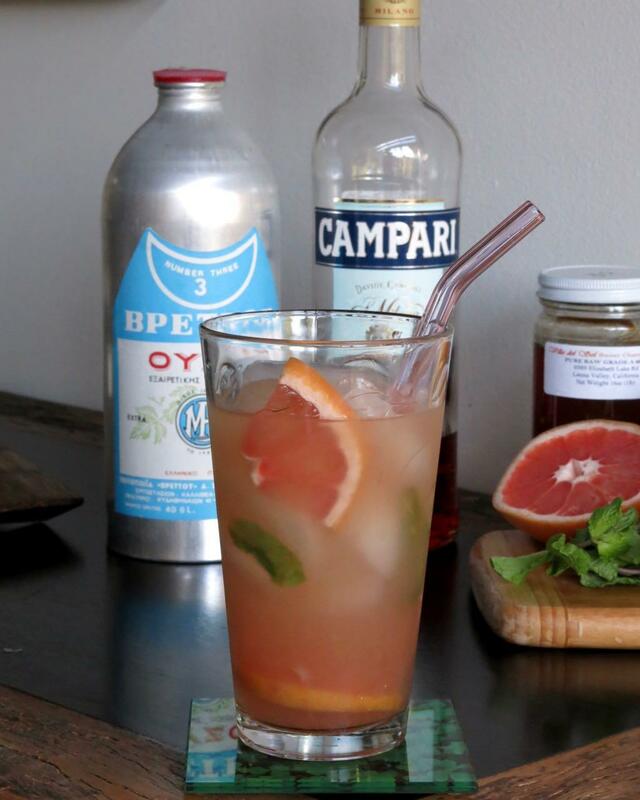 I'd say the Cynar nicely pumps up the bitterness in the very sweet grapefruits I had. 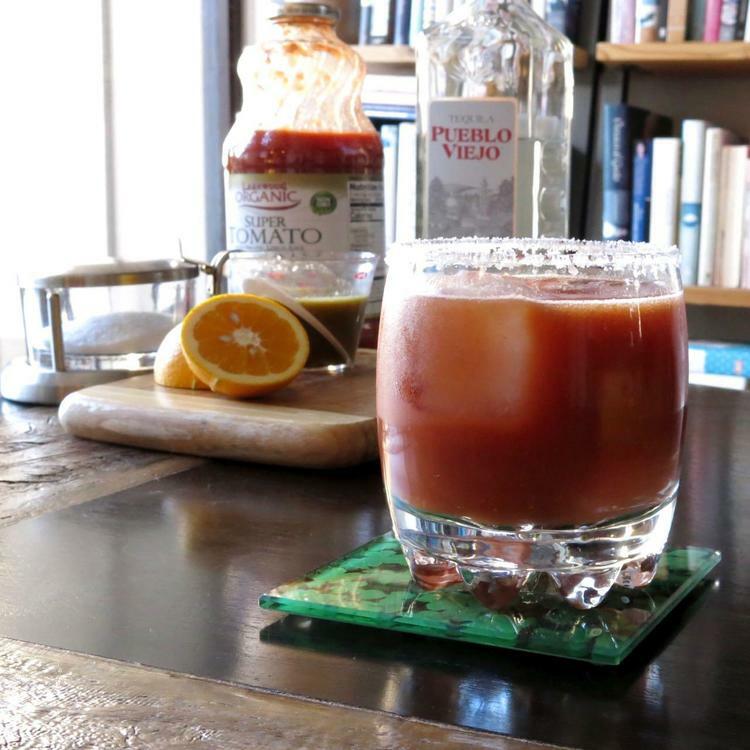 The Blanco Rojo got a positive review in one of the cookbook threads and I give it a thumbs up, too. Bloody Maria - a tequila Bloody Mary that includes orange juice and smoked jalapeño vinegar. I don't care for Bloody Marys but I thought the OJ and vinegar might be interesting. I suppose it was - I could taste each ingredient but I still didn't care for it. 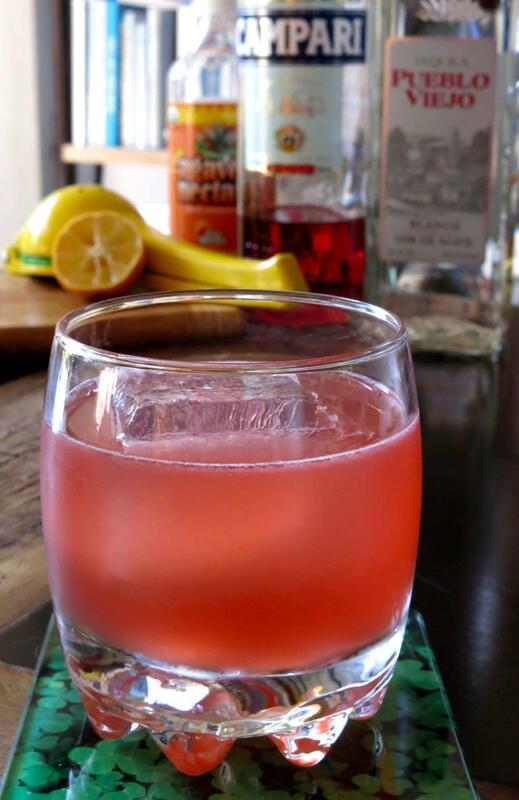 Doesn't matter where the recipes come from, if it makes a cocktail and you enjoy the cocktail, it's done it's job. Santorini Sunrise from Booze and Vinyl by André Darlington and Tenaya Darlington. After listening to an interview with the authors on the Good Food podcast, I bought a copy of the book. 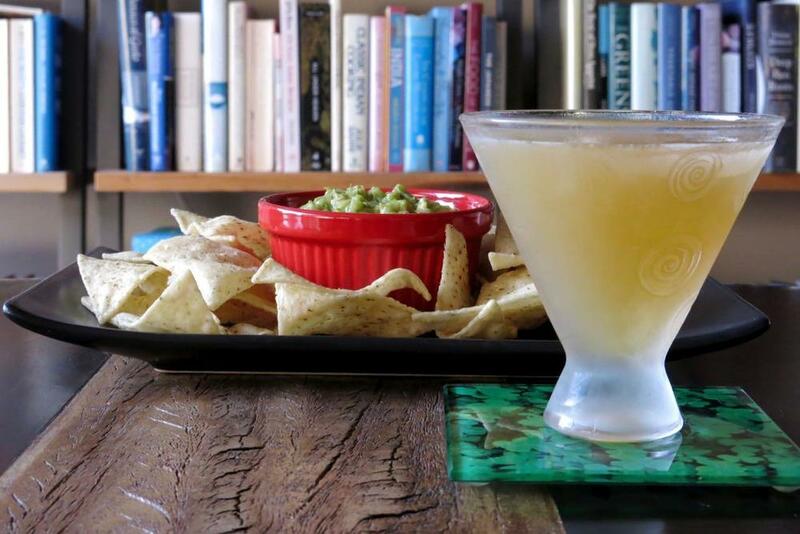 It's a fun guide to pairing music and cocktails or as the book says, "how to host a boozy listening party." There are 70 albums, divided by mood with an A-side and B-side cocktail for each album, along with "liner notes" about the artist and album and party ideas. There are classic cocktails like the Manhattan and Tuxedo that are paired with Frank Sinatra's In the Wee Small Hours while others are a bit different, like this one. Tonight, I flipped the book open to Blue by Joni Mitchell and this was the A-side cocktail. I brought some ouzo back from Greece but rarely use it and I had everything else handy so I queued up the music and stirred one up. Muddle the fruit, mint & honey, add ice and the rest of the ingredients and stir. As I read it, this recipe seems to be an attempt to use a liqueur as a base, and then work hard to keep the drink from being too sweet. The Batavia arrack added funk, the Noilly Prat dried it out, and the bitters and garnishes did their part to counter the saccharine base. I think it worked: first sip was sweet but then the countervailing forces kicked in. I'm out of the Clear Creek so I just used 1 1/2 oz Laird's bonded for the base spirit. 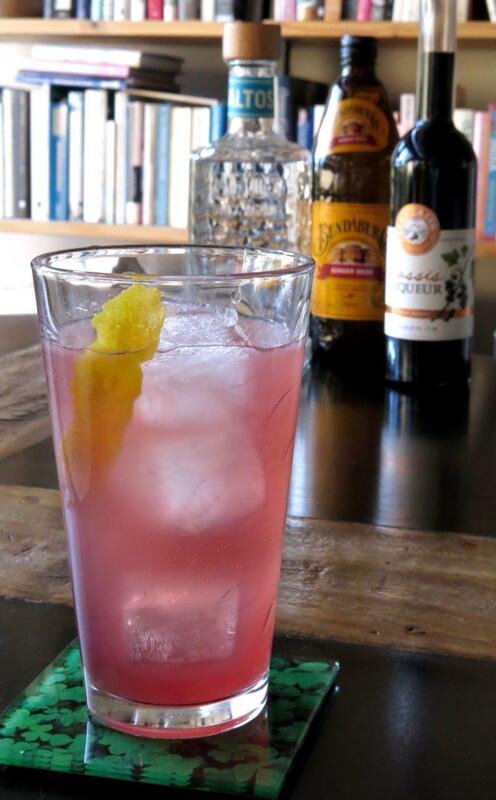 At the suggestion of a commenter at Kindred, I doubled the grenadine in place of the simple. Used homemade grenadine and homemade dram (which I poured a bit skinny as it's potent stuff). Plum forgot the nutmeg. Threw this together last night as a way to do something sort of tiki, liked it enough to put it on KC. Shake, strain, coupe. 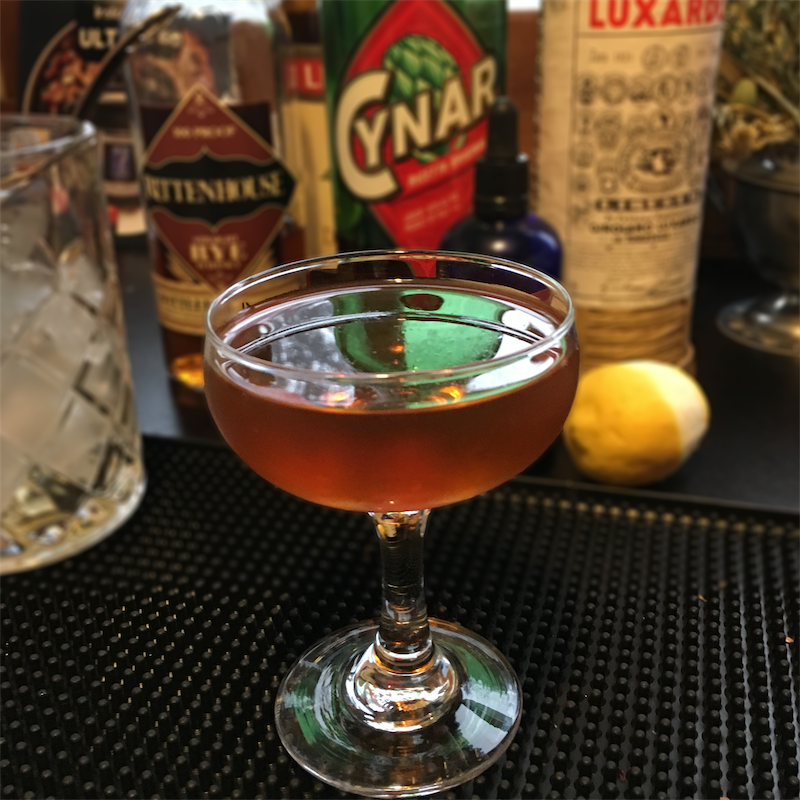 The Giffard/Becherovka subbed as a more potent (alcohol and flavor-wise) Donn's Mix. The Giffard/Becherovka subbed as a more potent (alcohol and flavor-wise) Donn's Mix. This intrigues me. 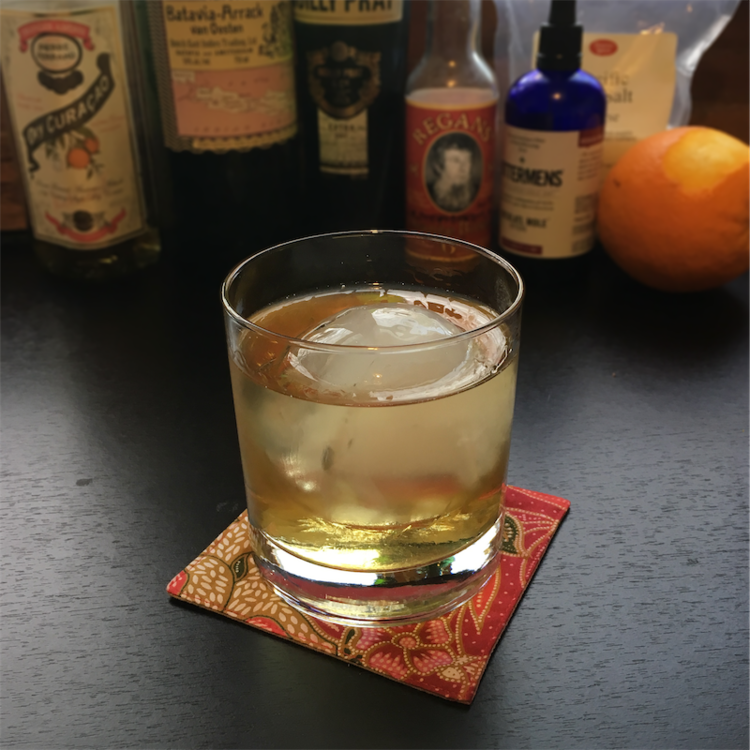 As a replacement for Donn's/Don's mix I've been using equal parts white grapefruit juice and tincture of cinnamon (W&N Overproof). While I suspect mine beats yours alcohol-wise hands down, white grapefruit is all but impossible to source. Have you tried your combination in a zombie? Not yet, but that would be an interesting application, with perhaps some tinkering of the overall ABV to keep that drink from becoming even more lethal. But yeah, Donn's mix isn't terribly shelf stable with the fresh juice, it would be nice to have those flavors without having to always have cinnamon syrup and fresh grapefruit around, or if you want the flavor but less sugar. I'd like to tinker with ratios to see how close it could approximate the overall flavor (while knowing there's no real substitute for fresh juice). Adding some drops of that cinnamon tincture is a good thought. The "Drinks!" forum is slowly giving me a bit of a complex. I feel like I may be the only person reading it that isn't actively looking for ways to get more alcohol into drinks. I find myself frequently wishing I could make them less potent without making them less tasty. Maybe my drinks palate just isn't up to par or maybe it just speaks to the quality of grapefruit I can get where I live. 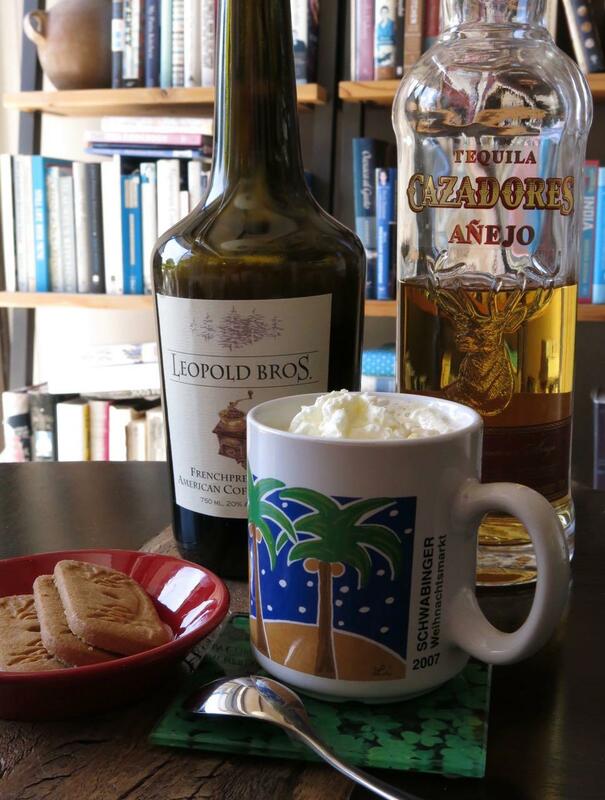 I've not noticed any real quality drop in tiki drinks calling for Don's Mix if I use white grapefruit juice from a carton and cinnamon syrup. Truthfully, I don't notice sufficient drop in quality in most of the drinks using BG Reynold's Don's Mix to take that away as an option. But I'm just an enthusiast, not a connoisseur. I only meant comparing a 100% spirit-based "Donn's Mix" with a one containing juice, fresh-squeezed or not. 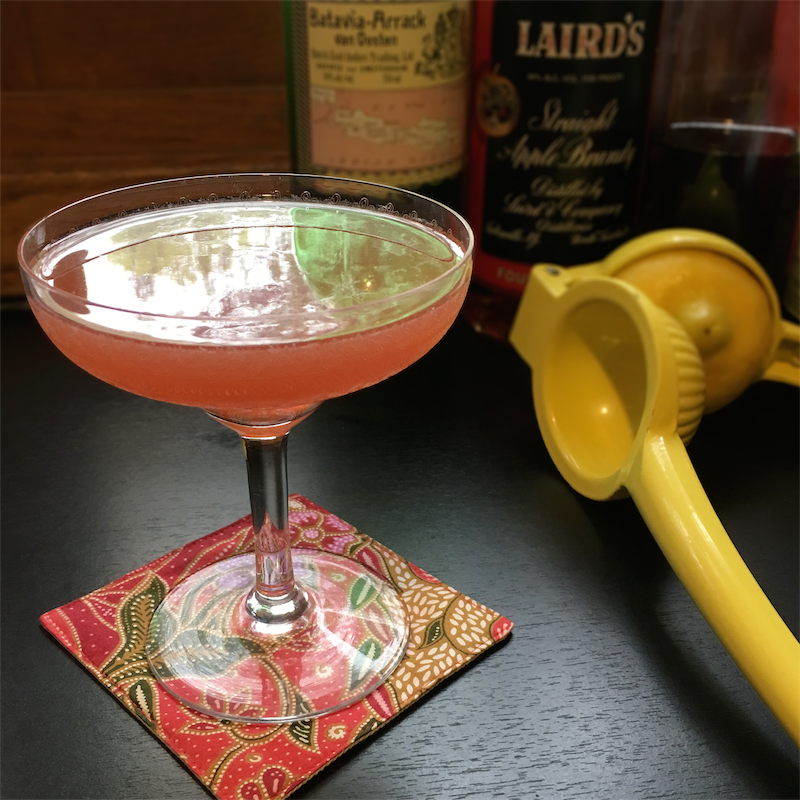 A juice-based version is always going to taste different, but I have no problem bringing other flavors, especially from the Becherovka, into the fold to create something familiar but distinct from the traditional mix. I also would imagine once opened even the BG Reynolds version has a shelf-life, but agree it's a nice shortcut if you want that exact flavor. That's ok, I wasn't arguing... just joining the conversation. I've fully accepted that my drinks palate is not all it could and probably should be. And yep, the BG Reynolds does have a shelf life even in the fridge. It's a pretty long one but it's also a bit of a compromise compared to fresh juice and cinnamon syrup. Just not enough of a compromise for me personally to stop me from using it. I like the thought process behind your substitute and I'm betting it works great. But like I said, I'm very rarely looking to add more alcohol to my drinks. Truthfully, if I could make versions of my favorite drinks that still tasted like they're supposed to with much less alcohol than called for, I probably would. I generally have pretty much zero interest in any of the effects of alcohol other than the taste. I have the same problem with beer. Love it but can't drink as much as I'd like because my once well developed alcohol tolerance has been allowed to dwindle to very low. And despite what advertisers and some consumers would have me believe, there is not a low/non alcohol beer that is anywhere close to being worth drinking. Strawberry Fix from Sasha Petraske's Regarding Cocktails was delicious with some spectacularly sweet and fragrant strawberries from Harry's Berries. 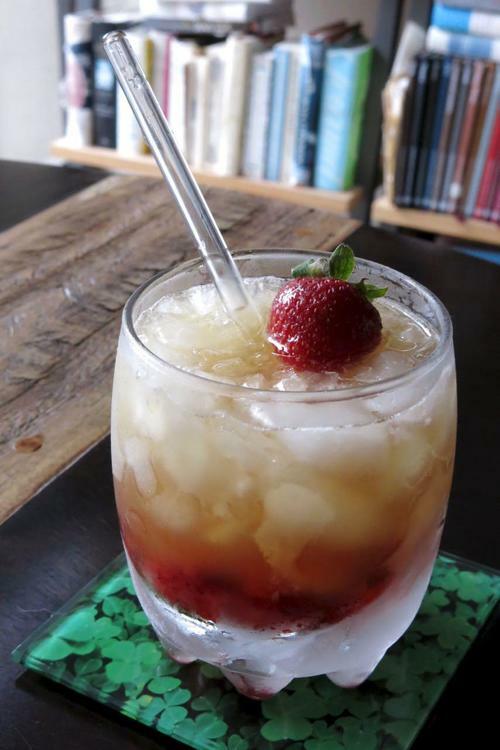 Muddled strawberries, lemon juice, simple syrup and mostly, bourbon. The two new-to-me punches I made for the adults at a graduation party (kids got a raspberry sherbet/pineapple juice/ginger ale crowd-pleaser). Left is a Painful Punch. Right is Ferdinand and Isabella. Painful Punch was good. 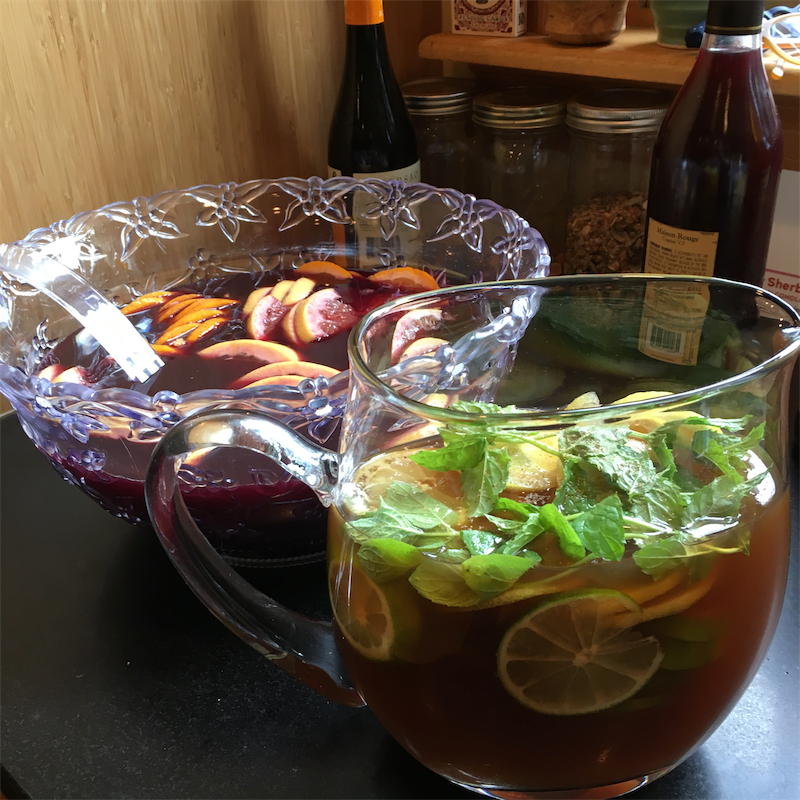 Labor involved (toasting spices, reducing orange and pineapple juice) was kind of fun and made my kitchen smell good, but in the end this tasted more or less like a simple sangria. Ferdinand and Isabella went faster at the party, and is one I would repeat. I subbed Papa's Pilar rum for the pricy Zacapa 23 at the liquor-store-guy's suggestion and that was a smart $20 saved.